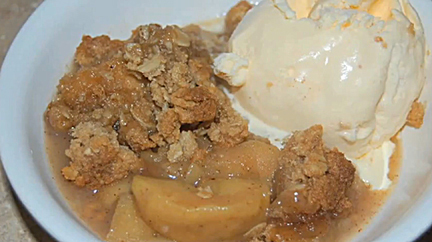 Apple crisp has all the good apple stuff that goes into a pie, with a rich, crunchy topping. There are many variations, such as adding other fruits like cranberries, raisins, or pears, or in the topping (one person recently told us she uses graham crackers for her crisp, and we can’t wait to try it). If you have a good apple crisp recipe, we’d love you to send it along. Here is one of our favorites, passed down through the generations from Lois Castell Browns. We’ve added whole wheat flour to make it healthier than the original. Mix and match apples for maximum flavor. We recently used seven varieties in this recipe: Duchess of Oldenburg, Ginger Gold, Honeycrisp, PaulaRed, Rambo, Red Gravenstein, and Zestar. It was so good it exposed apple crisp’s one, great weakness: it doesn’t last. Preheat oven to 350˚. Core and slice apples into a buttered 8” square pan. Sprinkle lemon juice and spices over the apples. WE’LL BE SELLING APPLE CRISP, personal-size apple pies, apple pie pockets, fresh apple cider, and cider donuts, and fresh-picked apples from Massachusetts orchards in the Massachusetts State Building at the Eastern States Exposition (“The Big E”). It all begins this Friday, September 17, and continues daily through Sunday, October 3, from 10 a.m. until 9 p.m.
We’ll also be handing out copies of our 2010 brochure/poster, New England Apples, and recipe cards. If you are not out in the orchard, come by our booth and say hello.